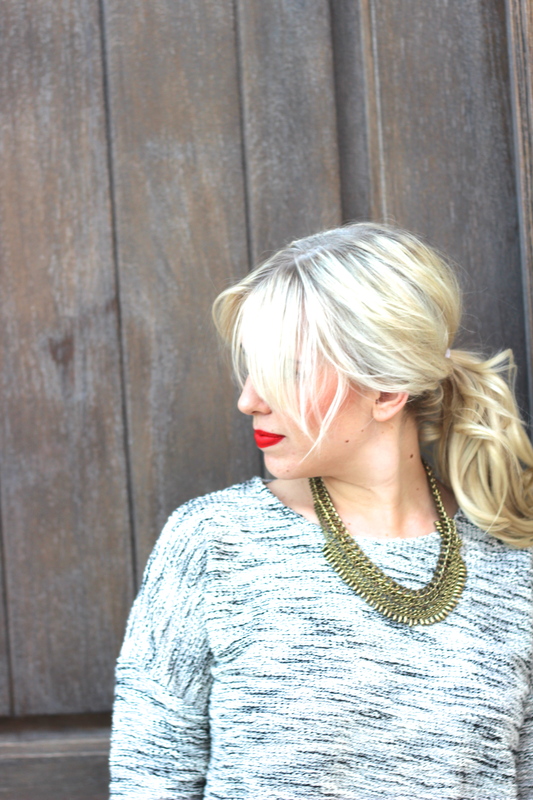 Edgy chic... - Lovely Blonde Closet "
Happy Monday everyone! I hope you all had a wonderful weekend and are recharged and refreshed to begin a new week! I wore this look the other night for a dinner date with my hubby (plus the little one of course). We actually have yet to go out without our little Addi. Being apart from both of our families in the summer makes that tad difficult, so that is one thing we are looking forward to doing once we are home. I am picturing a dinner and a movie date (it’ll be my first movie in a theatre in 6 months!) – although in this moment I get sad thinking of leaving our babe for the first time – it’s so bittersweet! These faux leather joggers caught my eye and I instantly envisioned wearing so many cute things with them this fall and winter! 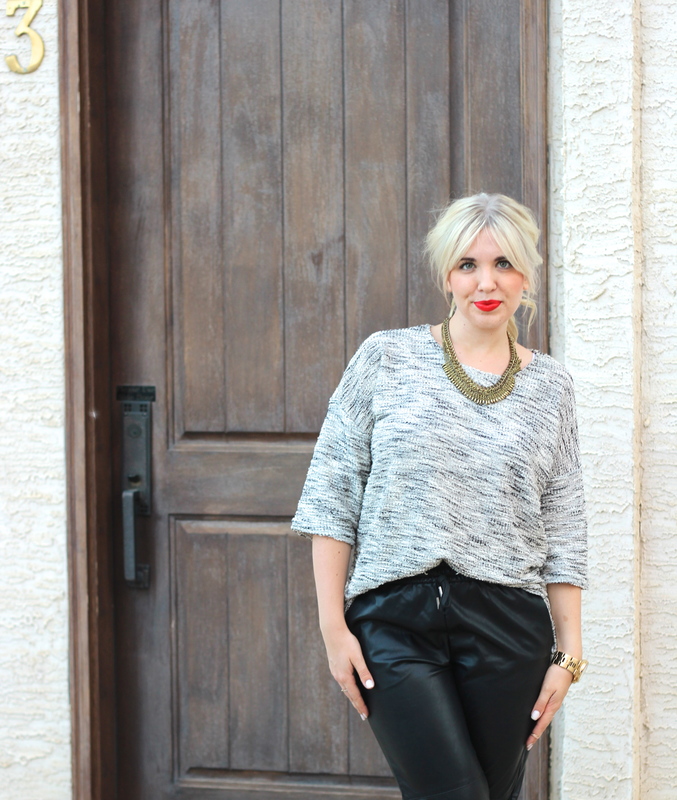 I threw on this knit relaxed fit t-shirt, some heels, added a statement necklace and bold lip and ran out the door! Sometimes the simple is best, and in this case, it created an ultra chic and edgy look! On another note, we are officially in the teething zone, and I am officially in the zone of shedding my thanks-to-pregnancy-thick-hair – I may or may not be crying as I write this! I always heard from girlfriends that you start to lose some hair at some point after your baby, most said around three months – so I assumed I was the lucky one who missed that stage – but the joke is on me because here I am.. losing hair left, right and centre. Any of you mama’s have any tips on how you kept some thickness to your hair post baby – or how you prevented it all from falling out? Any advice would be appreciated! I love this outfit! So chic, and I need to go hunt down these pants now! I thought I skipped the stage of losing my hair as well, I started losing my hair when my son was 9 months old, I have a section if my hair right in the front that is slowly growing and styling has become such a pain! I so feel you on that! As for your outfit, you look amazing and I live the pants! Aw shoot hey! Wow 9 months, you definitely probably thought you lucked out! I am just finding all of my ends broke off and my whole head has just thinned out completely. Oh well!! I guess I need a new haircut maybe haha. Glad I am not alone! I thought I was lucky enough to miss out on the hair loss stage too……but then 4 months hit and I might be bald soon 🙁 Hang in there!